Group of bicyclists rolls out in Pasadena and San Marino in a campaign to preserve the Engelmann oak from developers' axes. Under the span of a large California oak near the Caltech campus, a disparate group of bicyclists gathered Saturday as if on cue. They had chosen their meeting place in part for shelter from an unseasonably warm November sun. But it was also for what was situated nearby: a healthy concentration of Engelmann oaks, one of the more endangered species in California. The ride, which was organized by the Arroyo Seco Foundation, was billed as part of the group's campaign to preserve and protect the Engelmann oak. For two hours, the cyclists crisscrossed the streets of Pasadena and San Marino in search of tree specimens. Among the attractions: a lone Engelmann in a parking lot just east of Pasadena's Lake Avenue shopping district that ride organizers said is slowly being choked to death by its concrete surroundings; a canopy-like tree that stretched out over a quiet city street; and a one-story house built around the few-hundred-year-old Engelmann in its frontyard. "One of the reasons we are doing this on a bicycle is so that you can get a context of the thing," Dennis Crowley, one of the ride's leaders, told the group as members rolled toward a sprawling tree, impressive even from a block away. "You wouldn't get that from the windshield of a car." The group learned to recognize the Engelmanns by their distinctive leaves -- oval and flat -- and by their dark brown acorns, which are stubby and squat. The trees, they learned, are indigenous to a narrow strip of land that straddles Los Angeles, Orange, Riverside, San Bernardino and San Diego counties. Named for a St. Louis botanist, the species Quercus engelemanii Greene thrives in foothill land, typically 20 miles or more from the ocean. As the specimens found on Saturday's tour demonstrated, the Engelmanns often grow to a height of more than 50 feet, and sometimes require cabling or poles to support their heavy, octopus-like limbs. 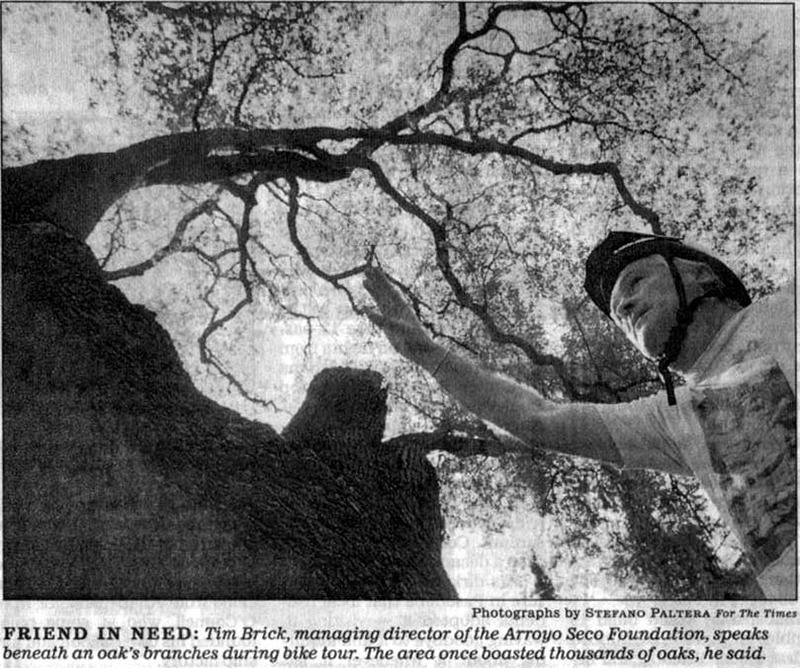 Tim Brick, managing director of Arroyo Seco Foundation, said the Pasadena area was at one time populated by thousands of Engelmann oaks. But their number has dwindled as development in the area, especially along the mesas, has led to the trees' destruction. "Swimming pools have taken a lot of oak trees," Brick said. "What's going on in this tree is incredible stuff," said naturalist Jeff Chapman as he stood underneath an Engelmann oak on the Caltech campus. "It's got the world's most amazing water pump." For the last few years, the Arroyo Seco Foundation has been collecting the tree's acorns and raising them to seedlings at a local nursery. Before the riders left their last stop and headed back to their cars, Brick urged them to visit the Foundation's Web site and help save the precious tree. As a leaf blower buzzed in the background, Chapman read a poem that paid tribute to the mighty oak. "We're all messengers," Chapman said, "of the information we've learned today." NOTICE: In accordance with Title 17 U.S.C., section 107, some material is provided without permission from the copyright owner, only for purposes of criticism, comment, scholarship and research under the "fair use" provisions of federal copyright laws. These materials may not be distributed further, except for "fair use," without permission of the copyright owner.